Everyone would like great waterfront or park views, but it's not enough normally to just live in a building fronting on a waterfront or a park as most such properties have many apartments without major views. This red-brick, two-building complex that occupies most of the eastern half of the block bounded by Sutton Place South, First Avenue and 53rd and 54th Streets was designed to maximize its waterfront and park views. 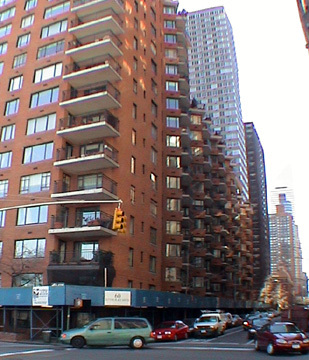 The architect, Arthur Wieser, split the building into two 20-story slabs separated by a garden courtyard, but, more importantly, put balconies facing the courtyard and angled them towards the East River. He also angled the balconies on the sidestreets. 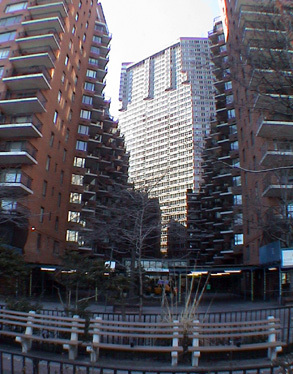 The two buildings in the development are joined by a glass-enclosed lobby with an driveway entrance on Sutton Place South. 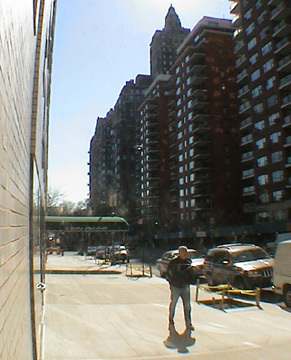 "Wieser," noted Robert A. M. Stern, Thomas Mellins and David Fishman in their fine book, "New York 1960, Architecture And Urbanism Between The Second World War And The Bicentennial," (The Monacelli Press, 1995), "visually broke up the slabs by canting walls of the living rooms and master bedrooms to shelter a terrace and to create a diagonal oriented east, toward the river views, for even the rear-most apartments. This feature, probably derived by Loebl, Schlossman & Bennett's Darien Apartments (1948-1951) on Lake Shore Drive in Chicago, resulted in five-sided bedrooms and living rooms." The white concrete slabs of the balcony floors are strong accents against the red-brick facades and the proportions here are quite fine. Furthermore, the view from the park back to the west and the building is interesting because of the rakish angles of the courtyard balconies. The building achieves an excellent sense of openness. In stark contrast, another building that adopted a similar approach, 1025 Fifth Avenue (see The City Review article), is far less successful and attractive in part because it is really a sidestreet building with only a midblock frontage on Fifth Avenue and because its facade is a lackluster beige rather than a strong red and, finally, because its design is less inspired. This 367-unit development was completed in 1951 and converted to a cooperative in 1955 and is a significant contributor to the allure of the Sutton Place neighborhood.